It was educational to see how they taste and grade matcha. To begin with, we looked at the tencha leaves. 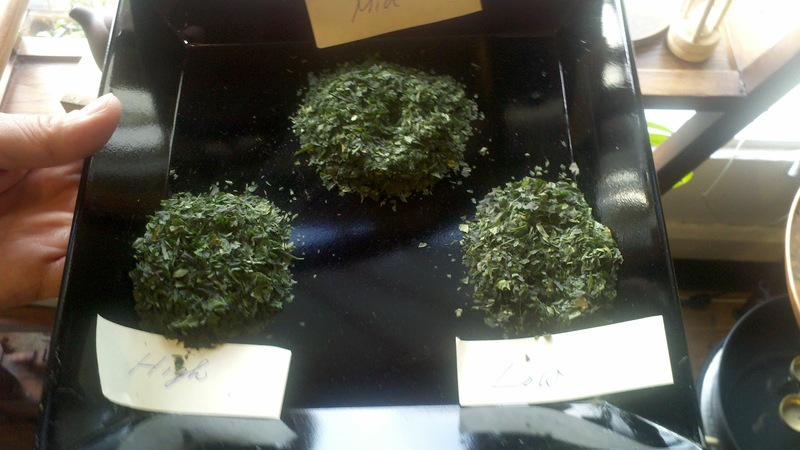 The tea plants for matcha are grown under shade, and the tender leaves are harvested, immediately steamed and dried. Then the leaf part from in between the veins are used.This is tencha, before the leaves are ground. The two-week program (July 30 -August 10, 2012) offers serious students from abroad a number of unique opportunities to study the Japanese garden. Some days will be divided between site visits and lectures on campus, but there will be several all-day excursions as well. On-site lectures will be given in some gardens that are usually not open to the public. The 15th seminar is now in the process of accepting applications for review and selection. In order to provide maximum personal attention, we strive for a group limited to not more than 25 students. However, if there are not enough applications, and the resulting number of selected participants is less than 20, the seminar may be canceled.Anyone with a serious interest in Japanese gardens can join the two-week Intensive Seminar Plus at a cost of 420,000 Japanese yen (about $5,380 USD at ¥78/$1). Students under the age of 35 who are enrolled full time in a school or university can participate at a reduced fee of 350,000 Japanese yen, but have to submit proof of their age and full-time enrollment. This seminar fee covers: all lectures, entrance fees and transportations to site visits, excursions, course materials exclusive for participants, and rooms with breakfast in a comfortable inn (13 nights at shared rooms) for the duration of the course. ALL APPLICATIONS FOR THE YEAR 2012 PROGRAM MUST BE RECEIVED BY FEBRUARY 29, 2012. Download the 2012 Japanese Garden Intensive Seminar pdf pamphlet.